At the office I wore a simple black merino wool cardigan, and for the evening, a simple swap out for my favorite leather jacket (from Express circa 2004 when they still made jackets from genuine leather) and I'm ready to grab a cocktail or head to dinner. 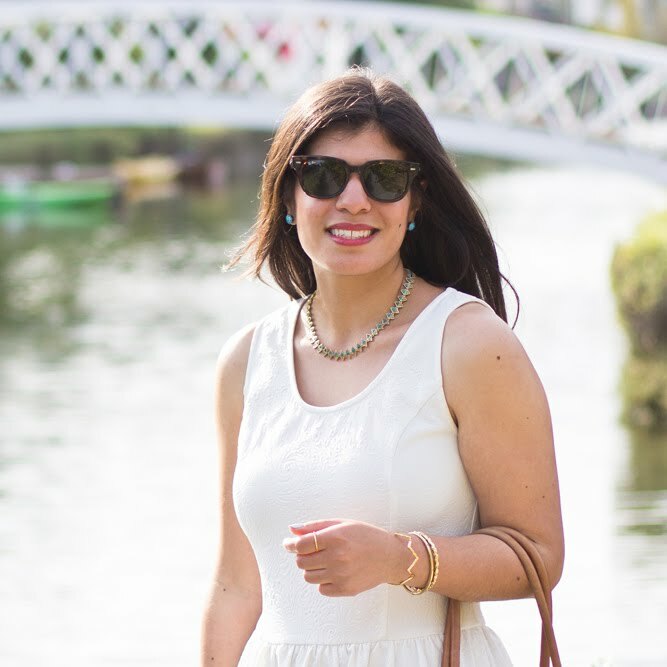 I'm never sure how long I will be able to hold out with bare legs and bare toes this time of year, so I try to take advantage any chance I get. It's usually these in between times when I can get away with just adding a great jacket to what would otherwise be a summer look and just dealing with being a bit chilly at night. Love this chic and slightly edgy look! I love Express jackets and wish they still made them in leather. Leather just ages better and lasts longer! Your jacket is gorgeous! That jacket is so great, it's a shame that they've started using less quality materials now. Winner combo.. 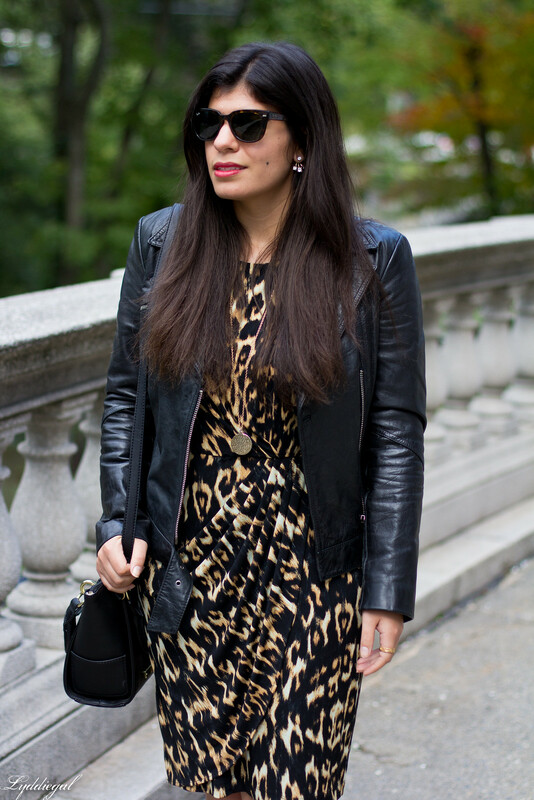 I love leather + animal print!! I had no idea Express ever made genuine leather jackets - they only came to Canada in about 2014 - but looking at this one, I'm really sorry they've chosen to diminish their quality, because it is such a beautiful piece and is clearly standing the test of time! 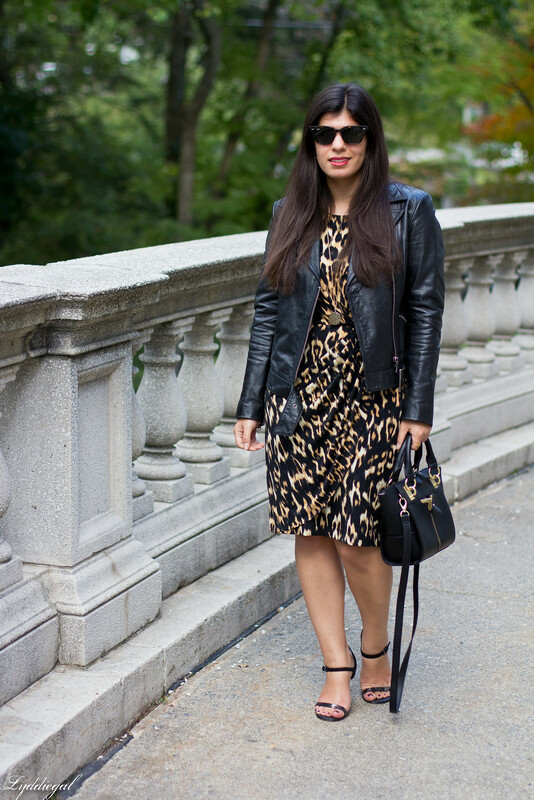 I don't really know if there is a better combination for fall than leather and leopard, but I'm inclined to say there isn't - this look is perfect. Loving this dress! It looks so great paired with your leather jacket. Ohhhh hey hottie! 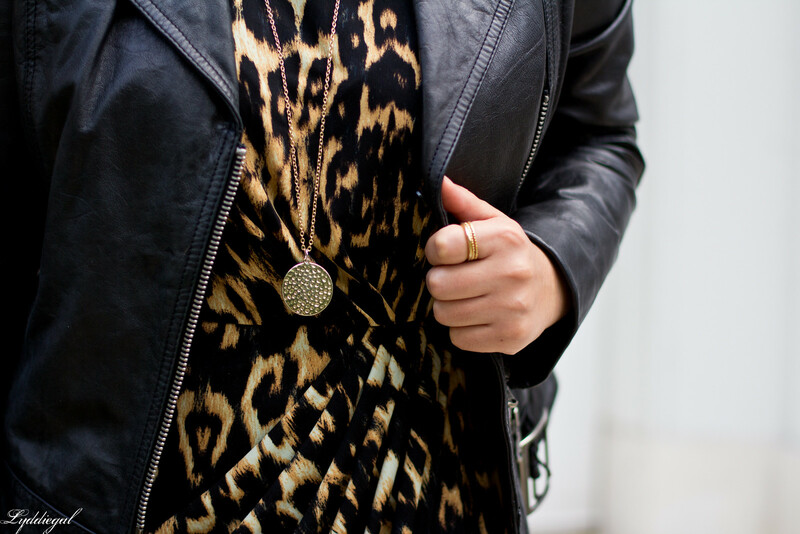 The leather and leopard combo is so fabulous! I need that jacket! Beautiful Lydia ! Yep, try to max out on the warmer days. I've seen what you point out with several brands, for example Nine West shoes use to make leather boots, long gone are those days too. Such a pretty leopard dress! I love it with your leather jacket! Classic and so edgy. You look fabulous, lady. So far we have had lovely weather too. We try to catch every sunbeam. Love this look! I agree, the bare leg timeline is tricky. It is definitely chilly when you leave work, but so tragic to wear tights already! This is so worth toughing it out, love those sandals. Indeed! I want bare legs forever! :-( I don't want it to get cold. 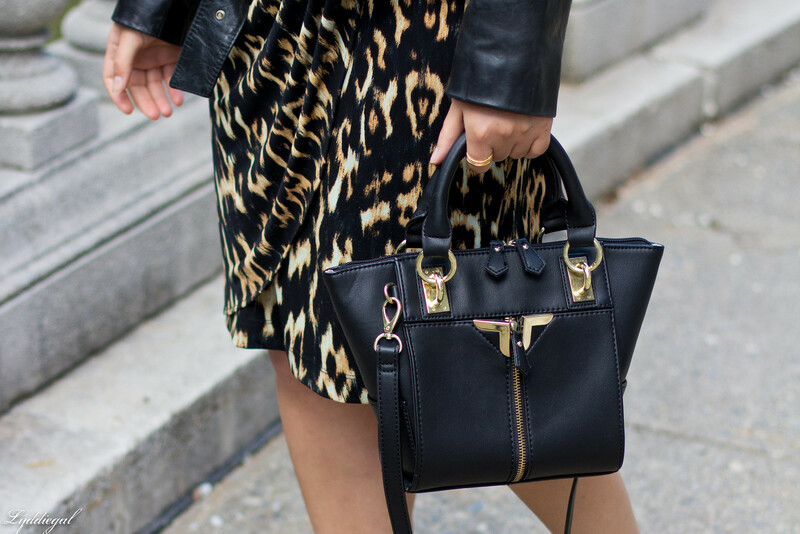 Love the leopard and leather! I love this combination. You looks so fierce! 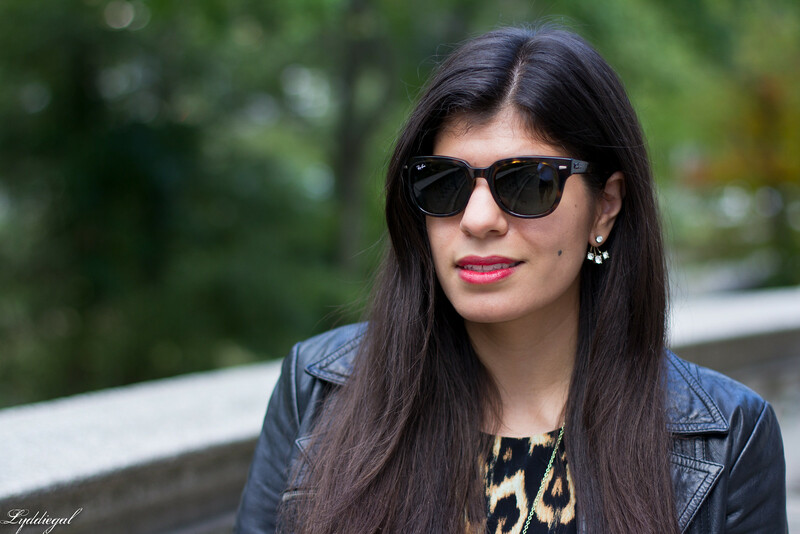 Leather and leopard is such a gorgeous combination that looks simultaneously chic and fierce. Love it!